At 3.4 years old, I have no problem with M watching television. When she was born however I had a different opinion: I was not going to allow my kids to watch television more than a half hour a day, max. I was going to enrich their lives with flash cards, reading books, drawing, singing, playing instruments - as mother I would keep them entertained every waking hour, so they would have no need for the television. That was before I found out how exhausting being a parent can be. Sure, I do all those things I just mentioned with both my girls, but sometimes a Mama needs a break, and sometimes kids need to just veg out in front of the tv. "Disney" has been a huge part of my life, so I knew I wanted to introduce her to Mickey and the gang before she got to know any other television characters. 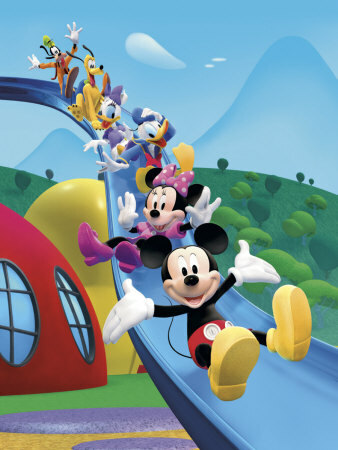 Around a year old I showed M an episode of the Mickey Mouse Clubhouse, and Mickey had her at his first "Meeska! Mooska!" Here we are two years later and we have seen every episode possible, know all the songs and have done countless "Hot Dog!" dances in our living room (and car when she watches it on the iPad). It is a silly show when you think about it: two mice, two ducks and two dogs (one that stands on two legs and talks, and the other who can't talk and acts like an actual dog) convene at a "clubhouse" and hijinks ensue. Oh and they are also joined by a very sneaky-but-misunderstood rotund cat named Pete (who has a pet bulldog) and a yodeling cow in capris (who has a pet dog) that owns a convenience store. Why does Donald the Duck wear a shirt, but when he goes swimming he only wears swim trunks? And why do Mickey & Minnie look exactly alike? Minnie is basically Mickey with a bow in his hair and a set of false eyelashes (which could be what he looks like Saturday night for all I know :). Don't get me started on Goofy - he brings nothing to the show if you ask me. The clubhouse is also an interesting place, where apparently the laws of gravity don't apply: there is an UPslide, where all you do is sit on the slide you are magically dragged up the slide, and there is a switch you pull and the kitchen spins into a bathroom, or a variety of other rooms that have been stored upside down (but where you can still take a bath upside down). There is actually a pretty great show for children underneath all this silliness. I am giving MMC full credit for teaching M three dimensional shapes (Show & Tell with Shapes episode). I will also give them full credit for teaching her the days of the week (Minnie's Calendar episode). It has helped her understand how to sort things by size, to differentiate patterns, to follow a list of directions, to count backwards and most importantly to solve problems. I will never forget when she was on the playground (over a year ago now) and she said she was stuck at the top of the slide and she screamed "Oh Toodles!" to bring her a Mousketool to help get her out of the predicament. If only you could actually yell "Oh Toodles!" in real life and have a magical floating Mickey head bring you the tools needed to help you out of a jam! So Mickey & Co. I thank you for entertaining and teaching my baby M over the last 2.5 years. If only I could get the Hot Dog song out of my head!! Ha, so funny you wrote this. The Duchess had a (rare) asthma attack yesterday and felt awful all day today, so she and Honey basically watched six hours (yikes) of TV, with time out for snacks, etc. (Mickey Mouse, Dora, Caillou, Berenstain Bears, Bubble Guppies, I can't remember the rest). I love when the Duchess and Honey do the dance at the end.